One of Moderat's best tracks get remixed in ultimately talented hands. Moderat aka Apparat & Nodeselektor's talents are being reinterpreted in oracle hands on EPs from the long player and they are as precious as the long player. 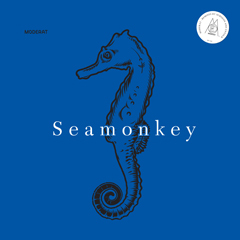 Two genre expert Untold and Surgeon treats "Seamonkey" well. Hemlock boss creates one of his best ever remixes and makes Moderat bass happy. If you like wonky basses and some dub step action in a darker edge, you are at the right place. This remix is going to be played so much. Surgeon's version is also dark, yet on the Sheffield aesthetic. A true techno romance for tha ones already forgot it. Surgeon is the real master of dark territories in techno. This is yet the darkest and for me the most delicious extracts from the recen Moderat EP.